Such is the case with Lindsay Little Theatre’s presentation of Homechild by Governor General’s Award-winning playwright, Joan MacLeod, running April 21, 22, 28 and 29. Warren wanted to do the play the minute she came across the scrip and was thrilled when the troupe decided to celebrate the nation’s sesquicentennial with a season dedicated to Canadian playwrights. “I think it’s a great opportunity to highlight this time in history,” said Warren. The play takes part in present day, centering on Alistair MacEachern (John Cook), a crotchety, funny and fearless retired farmer who, for 70 years, has silently longed for the sister he left behind in Scotland when he was brought to Canada as a ‘home child’. When Alistair suffers a stroke, suddenly these secret memories are unearthed leaving his family to make sense about his ramblings about Katie. For the most part, the cast is comprised of familiar faces including Pam Brohm (Alistair’s sister-in-law Flora), Karin McMullen and Anthony Jackson (friends and neighbours) – Dave Cook (son Ewan) and Marion Bays (adult Katie). Tarina Koty, who tackles the role of Alistair’s daughter Lorna, is not only brand new to theatre, but is also mom to one of the two actors who play Katie as a young girl. Taking a page out of fellow Lindsay Little Theatre director Altaire Gural’s book, Warren decided to double up when it came to casting Katie as it’s a pretty heavy role. “I was nervous that I wouldn’t find the right child for the part,” said Warren who chose Lyra McCann and Arianna Koty from the four who auditioned. Warren noted the role is a great opportunity not only for them both to grow, but also showcase their talents. “They each bring their own uniqueness to the role,” added Cook. Lyra performs April 21 and 29 while Arianna takes over April 22 and 28. As an added bonus to the production, Lindsay Little Theatre has arranged to have author and British Home Children advocate Sandra Joyce for a question-and-answer period after the April 22 and 29 shows. Joyce, who is vice-president of British Home Child Group International, discovered both her father and uncle were sent to Canada as home children. She was instrumental in the British Home Children receiving an official apology in the House of Commons on Feb. 16. 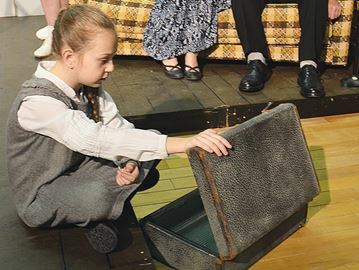 Show time is nightly at 8 p.m. Tickets for Homechild are available from the Academy Theatre for Performing Arts box office, calling 705-324-9111 or via www.kawarthatickets.ca.